Today the FAA issued a press release detailing at least one of their responses to the recent “sequester” of across-the-board spending cuts dimwittedly implemented by Congress. In a not-so-surprising move, they decided to close 149 traffic control towers across 38 states, representing about a third of the nation’s 500+ control towers. You can see the full list here. The closures will begin April 7th and will fulfill at least part of the $637 million in cuts required by the sequester. Indeed, it is estimated that about 2,500 jobs will be lost, and could affect the $200 million in business revenue these airports generate collectively. But that’s actually the less important issue, in my opinion a distant second, to the issue of safety. “We will work with the airports and the operators to ensure the procedures are in place to maintain the high level of safety at non-towered airports,” FAA Administrator Michael Huerta said. Just last week I encountered a situation at my local uncontrolled airport that made the hairs on the back of my neck stand on end. I was out flying in the pattern with other students and instructors, practicing short- and soft-field landings and takeoffs, when an airplane decided to join the pattern in an unconventional manner (taking a shortcut). That wasn’t the only problem–although he was active in stating his intentions to join the pattern for the active runway, 10, he was in fact flying to join the pattern for the opposite runway, 28. It wasn’t until he crossed directly through the downwind leg of the busy traffic pattern, narrowly missing another aircraft, that he realized his mistake. Sure, many of the airports whose towers will be closed might seem “sleepy” on most days. But having extra eyes on the sky is never a bad thing. They can help in emergencies, or when the weather gets bad, or when the traffic becomes congested. 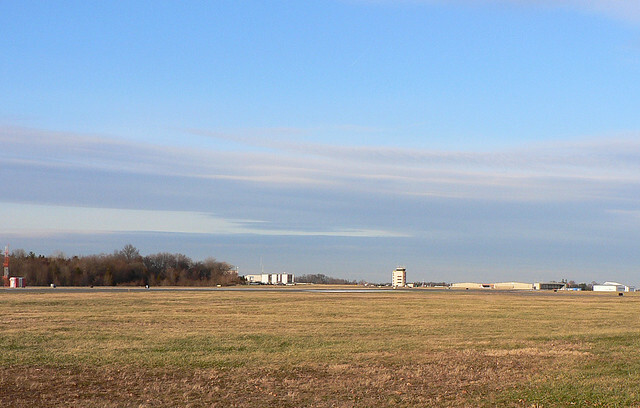 Let’s take for example the lone tower scheduled to be closed in New Jersey, at Trenton-Mercer Regional (KTTN, the airport shown in the photos in this post). It’s actually the first towered airport I flew to, and they were the first controllers I talked to, nervous as I was. It is not what I would consider a “sleepy” airport. According to the entry on AirNav, KTTN saw more than 200 operations per day in 2010, before Frontier Airlines added scheduled service to several destinations in the Southern US. I cannot imagine how this airport will operate without a control tower: large and small aircraft, intersecting runways, military operations, complex ramp space. Apparently there is the possibility of a last-minute amendment proposed in Congress to provide more funding for control towers. This seems unlikely to me, and since it has only been pegged at $50 million, may be insufficient anyway. The FAA mentioned that the towns themselves, such as Trenton, could take on the cost of operating the control tower. This may also be somewhat difficult. I’m not sure there are many cities and towns that have room under their financial belts, let alone the aviation saavy, to take on this responsibility. So it seems as though we as pilots will just have to make due, and after my experience last week, I can’t help but worry more about safety. In a final note about traffic and midair collisions, Richard Collins had this to say after he installed a traffic alert system in his small single-engine airplane (incidentally, based out of KTTN for many years). That sure is a scary thought, and with the loss of these control towers, we have many fewer eyes (or radar dishes) that we can count on to help keep enough space between our airplanes.